I don't think he was interested in covering his tracks at all, he wanted the world to know that he was responsible for all this terror. 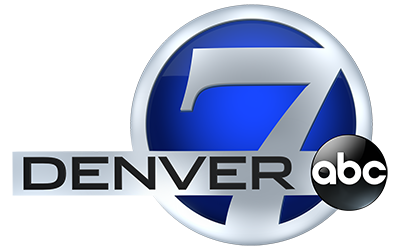 @Ann, the judge did not want the trial televised, which is why we can only see it via closed circuit and only Denver 7 has permission to show it. Dr. Phil's season finale this year was a 15 y/o schizophrenic teenager who bludgeoned his mother to death w/ a sledgehammer and set the house on fire trying to murder his brother. By time he interviewed him, he's already been convicted. Really would have liked to of seen that trial because the young man took the stand in his own defense and TOTALLY botched the whole trial for himself. It was not made clear who the female is in this photo taken with the gunman's cell phone. Videos prolly after lunch, but we shall see. 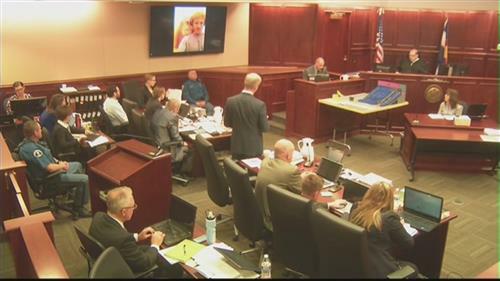 Has anyone noticed that the defendant seems to focus on the physical exhibit of the theater regardless of where it is located, rather than on the witnesses, judge or attorneys? It's almost as if he is internally replaying that night in his head, rather than paying attention to the court proceedings. He has also never exhibited remorse to any of the testimony of the surviving witnesses. There appears to be no empathy for the pain and suffering he inflicted. That is not to say he is "legally insane": but certainly a DS-5 antisocial personality disorder potential. HLN did an unsuccessful change of format about 6 months ago. They brought back most of the news type shows but did away with court programming. Now they only show an hour of Ashleigh Banfield giving legal updates. I don't know of any channel that shows live trials now. @rheba so you created that document? @McGruber: Perhaps nothing. "QWERTY" is the first 6 letters on the upper left of a keyboard. It is also the name for the type of keyboard standard in the U.S. I have seen that picture before and that girl looks completely photoshopped into the picture. Another photo taken with the gunman's cell phone and sent to his email account. @Lori thanks. I watched much of Zimmerman's trial on HNL and couldn't believe they weren't showing this one! @rheba - that list is very well done. the last date I saw is 5/12 - is that as updated as it is? @Niki yes The court has given a witness count and I'm right on the money. Comcast has Justice TV and they are airing this trial. Unfortunately I have DirecTV. @KP Thats because it was photoshopped..
@NH It's doubtful JH will take the stand, this is a death penalty case. That is WAY too risky! @lori butterfield You got that right, HLN's format change after jodi arias' trial was AWFUL. 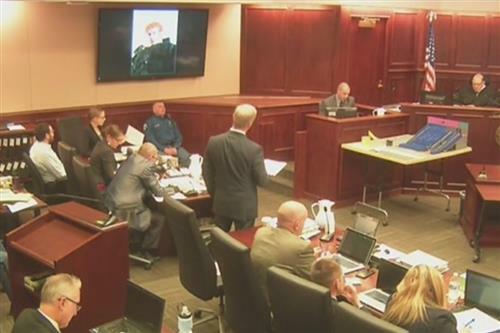 They advertised upcoming trials they planned to televise after hers and george zimmerman's that never were televised. Can his parents testify or will they does anyone know? I have Comcast, I have not seen Justice TV yet. I will have to search for it. Prosecution calls state-appointed psychiatrist Dr. William Reid to testify. What is the basic content of those emails they were reading? do we know? HEY! He looks like George Carlin!!! Here we go...the testimony we've been waiting patiently for. Finally.....here we go, first psychiatrist. @Ann You're welcome. I watched the Jodi Arias trial on HLN, myself, and also have DirecTV. I didn't even know Justice TV existed lol. Will someone share again the witness list. I'm glad I am not the only one that has been waiting for this! !